While miniature railroads like Sonoma TrainTown are fun for train buffs young and old, eventually you have to move up to experience the real deal. Railtown 1897 State Historic Park, in the Tuolumne County town of Jamestown, offers families the chance to see what a real working railroad looks like and, better yet, to experience a ride on a historic, century-old steam train. Railtown 1897 was one of the many state parks slated for closure in 2012, but due to the efforts of the park's many passionate supporters, it remains open for all of us to enjoy. 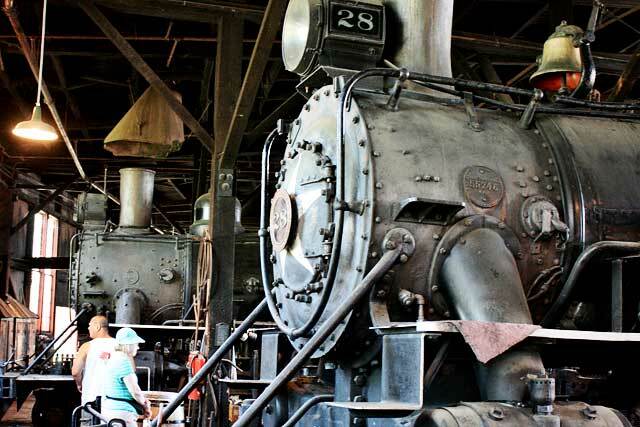 A three-hour drive from the Bay Area, Railtown 1897 is a fantastic destination for a family weekend getaway, especially when combined with some of the other Gold Country attractions in the area, like Columbia State Historic Park. If you're thinking of getting in one last road trip before summer vacation ends, this could be the place to go. As the name implies, Railtown 1897 has been around since the end of the 19th century, when it was known as the Sierra Railway, a short line railroad that traveled between Jamestown and nearby Sonora, Angels Camp, and Oakdale. The railroad's chief claim to fame, and one of the reasons that it's still around today, is its role in countless Hollywood movies, including High Noon, Unforgiven, Pale Rider, My Little Chickadee, and Back to the Future Part III, as well as TV shows like Wild Wild West and Petticoat Junction. The star of most of these productions is Railtown's Sierra Number 3, nicknamed "the Movie Star Locomotive," a steam locomotive built in 1891 and recently restored in the shops of the California State Railroad Museum in Sacramento. Sierra Number 3 is one of the three original engines that worked the Sierra Railway back in the 1890s, and it continues to work today taking visitors for rides through the Sierra Foothills on Saturdays and special occasions. Visitors to Railtown 1897 can take a self-guided walking tour around the grounds, where you can watch the trains and take in the exhibits in the park's historic buildings, including the collection of props and artifacts from the various movies filmed there over the years. If you stick around late enough in the afternoon, you can watch engines return to the roundhouse via Railtown's working locomotive turntable. 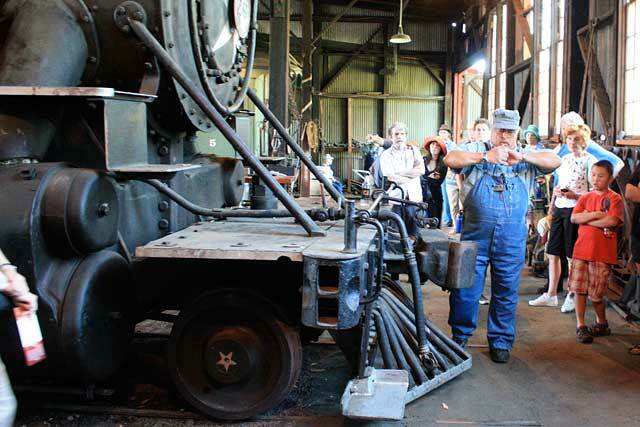 An absolute must, though, is the guided tour (included with admission), which gives you access to Railtown's amazing roundhouse—one of the last of its kind in the United States—where you can see the park's historic locomotives and engine maintenance facilities. Tour guides are extremely knowledgeable and share the history of the roundhouse and shops and show how locomotive repairs are carried out in 19th-century style. They're happy to answer your questions, too. 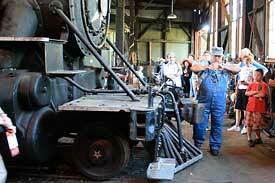 Also on the tour is the park's belt-driven machine shop and vehicles like hand cars and a Ford Model T modified to run on the rails. Tours take place hourly from 10 am to 3 pm during the summer and other times depending on staff availability the rest of the year; call (209) 984-3953 for the day's tour schedule. The big draw at Railtown 1897 is the opportunity to take a train ride behind an authentic steam locomotive. Rides depart from the depot every hour from 11 am to 3 pm on Saturdays and Sundays, as well as some holidays like the 4th of July. Rides pulled by a vintage diesel locomotive are also offered on Wednesdays at noon and 2 pm through August 28. Passengers ride in either an enclosed coach, an open "mountain observation" car, or even a caboose. The six-mile, 40-minute rides take you on a leisurely trip through the rolling hills and meadows of the Mother Lode. At the end of the line, near a rock quarry, the engine uncouples and runs around on a siding where it re-couple on the other end of your train for the return trip. During your trip, feel free to chat with the on-board car hosts, affable volunteers who know an awful lot about trains and the Sierra Railway. 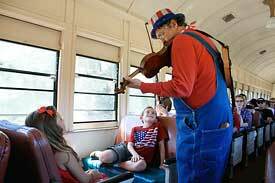 On some trips, you'll even be entertained by performers like Huckleberry, AKA local master fiddler Dave Rainwater. Our 4th of July ride where Huckleberry serenaded us with patriotic tunes is an experience we'll never forget! If you can, try to get up to the front of the car to take a look at the engine pulling up ahead. The sight and sounds of Sierra Number 3 pulling our train was really awe inspiring. It's fascinating to think that this locomotive is well over 100 years old. Railtown 1897 is really worth the trip for rail and history fans young and old. 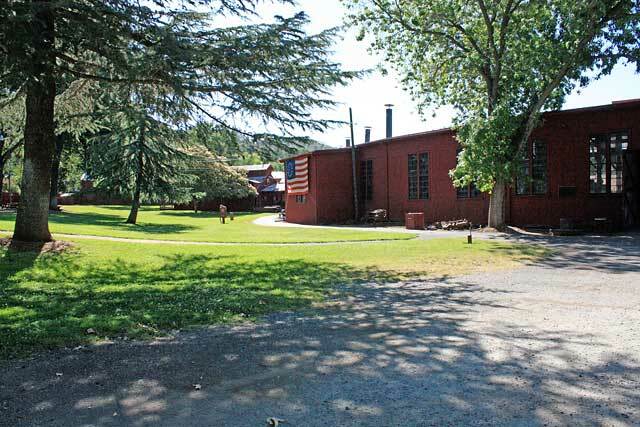 Railtown 1897 State Historic Park is located in Jamestown, California, between Sierra and 5th Avenues. It's open Thursday through Monday from 9:30 am to 4:30 pm from April through October, and 10 am to 3 pm from November through March. The park is closed Tuesday, Wednesday, Thanksgiving, Christmas, and New Year's Day. Train rides are offered from April through October on weekends and some holidays, from 11 am to 3 pm hourly. Visit www.railtown1897.org for more information. Admission is $5 for adults, $3 for youth ages 6 to 17, and free for children 5 and under. Train ride tickets cost $15 for adults and $8 for youth; children 5 and under ride for free, and train tickets include park admission. Reservations are not necessary, but you can check the ride schedule and order advance tickets here. Parking is free, and there's plenty of it. Consider buying a Railtown 1897 membership if you visit—the family "Telegrapher" membership costs $75 and includes not only free admission and rides for two adults, their children, and two addtiional adults all year, but free admission and train rides at the California State Railroad Museum in Sacramento, too. You also get a 10% discount in the Railtown and Railroad Museum stores, as well as a chance to get pre-sale tickets for the extremely popular Polar Express event in Sacramento during the holidays. 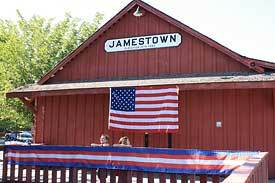 Jamestown and Railtown 1897 are about a three-hour drive from Marin and the San Francisco Bay Area. 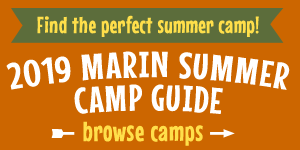 To get there, take Highway 101 to 580 in San Rafael and cross the Richmond Bridge. Follow 580 through the East Bay and over the Altamont Pass, then hook up with I-5 North and Highway 120 outside of Tracy. Take Highway 120/108 through Oakdale to Highway 49 and Jamestown. Follow Highway 49 into Jamestown, and bear right onto Main Street. Turn right on Willow Street, then turn right on 5th Avenue and follow it to Railtown 1897. There's plenty of free parking at the park at either the 5th Avenue or Sierra Avenue entrance. The Sierra Foothills can be extremely hot during the summer, so make sure you bring plenty of drinking water, hats, and sunscreen. The temperature often drops in the evening, so sweatshirts or light jackets EW a must, too. Restrooms and drinking water are available at the park. 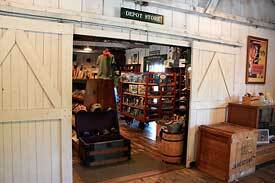 Food is limited to popcorn from a cart outside the depot (a bargain at 25¢ a bag) and cold drinks and candy from the gift shop. 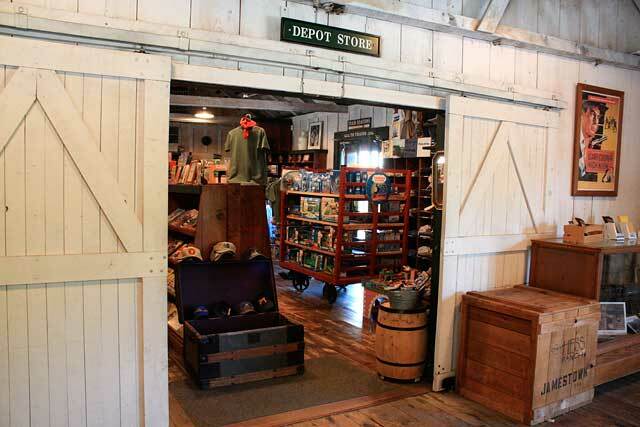 The park's shop also stocks a wide variety of railroad-related books, toys, T-shirts, and other souvenirs, including the ubiquitous Thomas the Tank Engine merchandise. There are plenty of picnic tables available in the Railtown's beautiful shaded grounds in case you bring your lunch, and you'll find several restaurants in Jamestown itself. 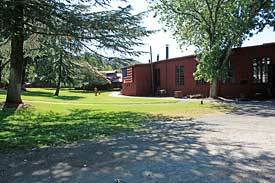 When we visit the Gold Country we usually stay at the Gunn House Hotel in nearby Sonora, which is about a 10-minute drive from Railtown 1897. It's sort of a mashup between a B&B and a motel located in an 1851 adobe, the oldest building in Sonora. It offers a pool, a fantastic breakfast with homemade coffee cakes and breads, waffles, and an egg casserole, and it's a bargain, to boot.